4 October 1957 (5 October Pole time). The signal was heard by Paul Siple and his crew at Pole. silently until 4 January 1958 (Wikipedia). For most of the decade ending in October 2008, things were simple. Pole used the MARISAT/GOES terminal, originally constructed in 2000-01 (left) to communicate with 3 satellites that used to be geosynchronous...here's a May 2000 Christian Science Monitor article about one of them--MARISAT. The RF building and MARISAT/GOES terminal 1 mile south of the station were first turned on in 2001, but they suffered through cold weather mechanical and electronics problems off and on ever since. 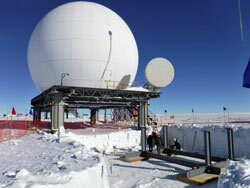 A radome was added in 2004-05 (photos), but that didn't cure everything...during the 2008 winter the gear drive system failed again...but this time a MacGyver effort by the satcom tech and station mechanics got things rebuilt and running (Antarctic Sun article). 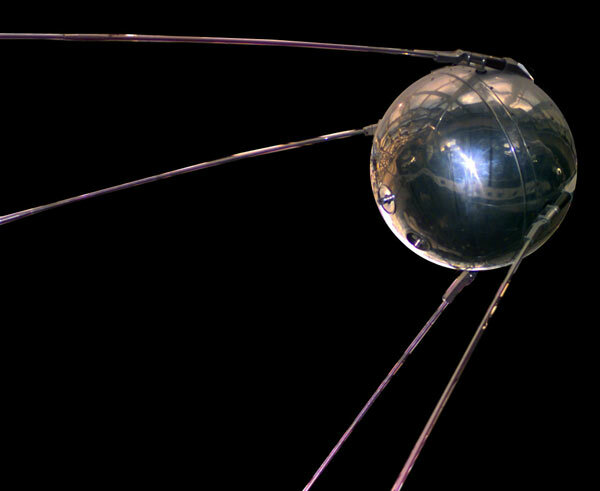 As for the satellites themselves, since they were old the orbits wobbled so the station could see them a few hours a day. MARISAT-F2 (Maritime Communications Satellite), GOES-3 (Geostationary Operational Environmental Satellite, as it was a NOAA weather satellite), and TDRS-1 combined [the links for individual satellites here are to Wikipedia articles] gave a window of almost 12 contiguous hours per day with an original theoretical 5 MBPS transfer speed, which has been upgrades several times over the years to more than 60 MBPS. Most of the increased bandwidth goes to data transfer. The oldest of these three, MARISAT-F2 was decommissioned in October 2008 after deterioration in its telecommand link (Antarctic Sun article). This cut the total window by two hours and the bandwidth by a bigger percentage. A year later in October 2009, the TDRS-1 satellite (or TDRSS-1, depending on the NASA contractor and acronym you prefer--TDRS is Tracking and Data Relay Satellite and TDRSS is Tracking and Data Relay Satellite System) also disappeared from service. The last TWTA (traveling wave tube amplifier) failed, and NASA moved it to another temporary orbit for decommissioning. The last day of service was 21 October 2009 (NSF announcement and Spaceflight Now news article). As for the changing/shrinking constellation of NASA TDRSS satellites--they have been TDRS F3, TDRS F4 (until it was retired in 2011), TDRS F5 (scheduled for retirement in December 2014--1 December 2014 USAP service announcement), and TDRS F6--a second antenna terminal, the 4-meter SPTR-2 (South Pole TDRS Relay) link was completed during the 2008-09 summer (right, a construction photo from Dave Smith; here are more), and here is an April 2009 USAP page with a link to an Antarctic Sun article--lots more info. These satellites often are available for much shorter periods on an ever-changing schedule, and at a greater expense to NSF. They provide a 5 Mbps IP data link, and a separate 150 Mbps one-way (northbound) link for bulk science data. Not all of the "above-the-horizon" time (what typically appeared on the old scroll satellite availability page) is actually available to USAP--the program aims for about 4 hours per day, and at one time this created a complex daily scheduling job for a friend in Denver. 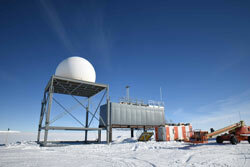 Here's the USAP information page about the TDRSS systems. 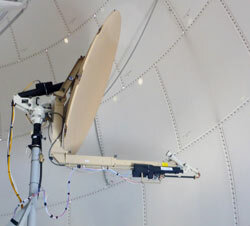 During the 2009-10 summer some field tests were conducted using the Intelsat/Paradigm/Astrium-operated Skynet-4C British military satellite, which was slowly increasing in visibility at Pole. Here is the October 2009 contract award announcement, a 2010 announcement from Intelsat, and a more detailed 2010 Intelsat report on the initial testing (interestingly, these satellites use the Oakhanger ground station southeast of London in the UK--while working for Ford Aerospace I visited that station in 1980 as part of a US Air Force satellite contract I was then involved with...and Philco-Ford, a predecessor to Ford Aerospace, actually manufactured the first Skynet satellites in the 1960s). 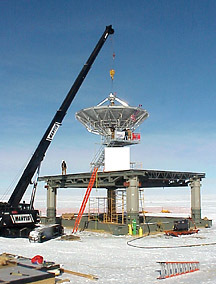 The Pole equipment was designed, some equipment was bought (January 2011 SPAWAR request for information), a dish and receiving system was installed in the large radome with the GOES dish during the 2011-12 austral summer (Skynet and GOES are in opposite directions), and USAP bought time on the satellite. But when the installation was completed, the satellite could not be located. Turns out that the Skynet orbit had been adjusted so that it was behind MAPO, so the earth station would need to be relocated. Instead, arrangements were used to use a different satellite from the same family, NATO-IVB, and tests were conducted successfully during the 2012 winter. For a time it was being accessed using the antenna in the GOES radome (left, photo of the 2.4 meter dish from Bartley Davis), and the NATO-IVB satellite was added to the Pole weekly satellite schedule in March 2014. I'm not sure of what ensued, but in any case Pole is now using the Skynet-4C for more than 4 hours per day with the antenna pictured at left. Skynet-4C was launched in 1990 from French Guiana, while NATO-IVB was launched from Cape Canaveral in 1993. The various Skynet and NATO-4 satellites are now operated by Airbus Secure Communications, a part of the Airbus consortium (a bit more info about the constellation). The NATO-IVB satellite is still available for use as well, but this would require a new antenna installation at Pole. Here's the USAP information page about the Skynet satellites and the terminal at Pole. Until midwinter 2016, in addition to NATO-IVB, Skynet, and various TDRSS satellites, Pole was using GOES-3, which provided a 1.5 Mbps inbound and 1024 Kbps outbound data rate for about 6 hours a day. But during 2015 tests were conducted on a Defense Satellite Communications System (DSCS) satellite which was slowly drifting into view. Then, on 29 June 2016 NSF announced that the GOES-3 satellite was being decommissioned...and being replaced by the much-better-bandwidth DSCS-3-B7 satellite. More information on the demise of GOES is here...and here's an October 2016 Lockheed-Martin press release describing implementation of the DSCS satellite. Meanwhile, the DSCS satellite had been added to the weekly satellite schedule in June 2016. 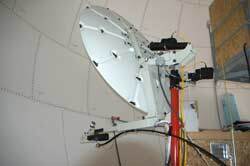 Here is the USAP information page about the DSCS satellite and antenna systems. 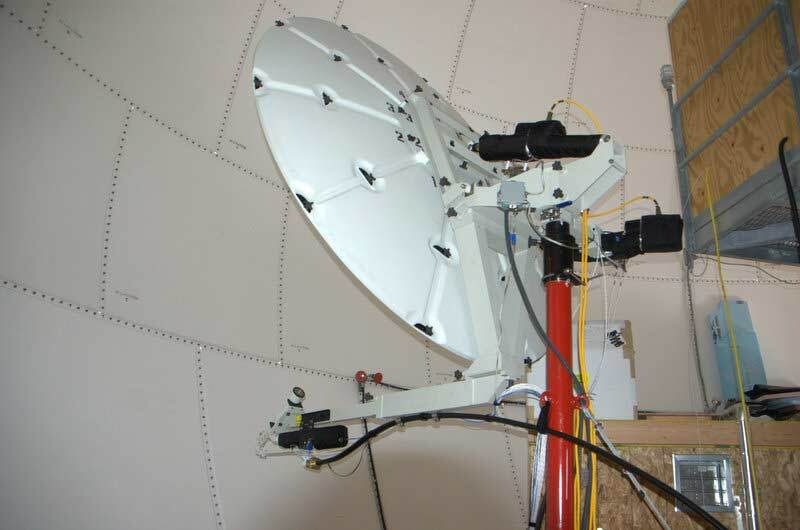 At right is a photo (from Mike Rice) of the 2.4 meter dish currently being used for DSCS, this is also inside the large GOES radome. Between mid-March and mid-July 2017, the DSCS satellite was unavailable due to major issues with the terminal in Christchurch, including failure of that antenna's elevation drive. The issues proved major enough to require special NSF funding and ITAR approvals to allow the necessary hardware to be shipped from the U.S. to New Zealand. AARGH! Later, a significant upgrade to what we once knew as the MARISAT-GOES terminal was begun in 2017-18 (more info) to improve its capability to handle DSCS-3-B7 traffic. In 2018-19 the project was continuing with the erection of a new radome next to the RF building (right, photo from Ryan Dyer) (more info). At least one of the 2.4 meter Skynet and DSCS antennas was relocated from the large GOES radome to this structure so that it can be used without interference from the 9-meter dish when it is reactivated for DSCS. -the recently upgraded and enhanced USAP satellite information pages with links to the weekly satellite schedule PDF file as well as this systems architecture diagram and overall system FAQs. 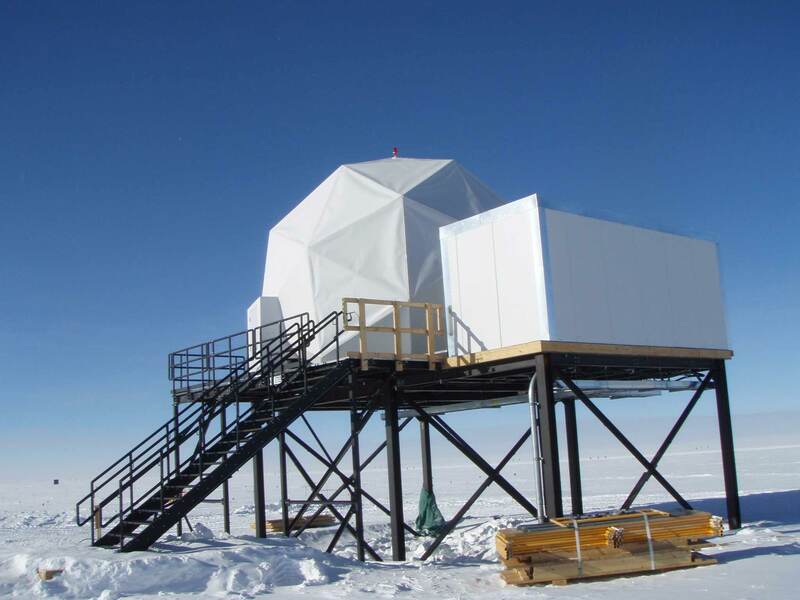 -a brief NSF 2006 Powerpoint presentation by Erick Chiang and Pat Smith, titled "Data Communications Supporting Astronomy/Astrophysics at South Pole Station" which addresses the conditions and future plans at that point in time. -a May 1995 report by Bob Loewenstein, Bill Smythe, and Brent Jones, Science Requirements for South Pole Station Computing and Communications. Some interesting facts, figures, and historical background. 1 GB/day of data transmission--hmmm, where would that leave IceCube?